A Hero Must Choose: The Power of Ideals... or the Courage of Truth? When Ash and his friends enter a battle competition in Eindoak Town, they meet the Mythical Pokemon Victini, who becomes their newest friend. But disaster strikes when the misguided wanderer Damon seizes Victini for his own plans! Can Ash prove himself a hero and earn the help of the Legendary Reshiram—or Zekrom—to rescue Victini and save Eindoak Town? Two legends...and two versions of the story! 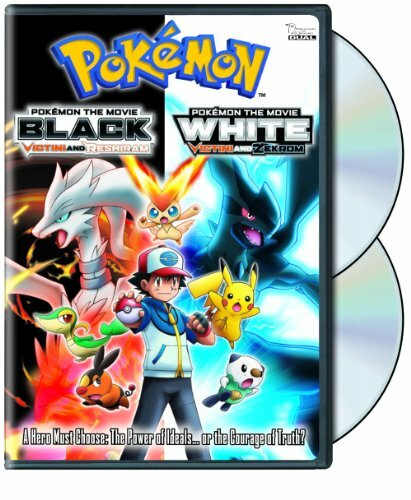 Follow them both in Pokemon The Movie: Black—Victini and Reshiram and Pokemon The Movie: White—Victini and Zekrom! It’s twice the Pokemon adventure! If you have any questions about this product by Viz Media, contact us by completing and submitting the form below. If you are looking for a specif part number, please include it with your message.